“I was not ready to give into my wife, Julia’s, paranoia about my 1-year-old’s ill health. When he was just 6-month-old, Jubaid started developing hard lumps around his stomach. With every passing day, his lumps only grew bigger. My happy child has become so irritable and has constant fevers. It was scary to see his smile slowly fade away.” Yusuf, Jubaid’s father. Being the youngest in the family, Jubaid is the apple of his parents' eye. He cries very less. It took Yusuf a while to realize that Jubaid's happy face hides so much pain. After several tests, little Jubaid was diagnosed with hepatoblastoma, a condition which causes development of cancerous tumors in the liver. His multiple tumors can spread and turn fatal at any moment. 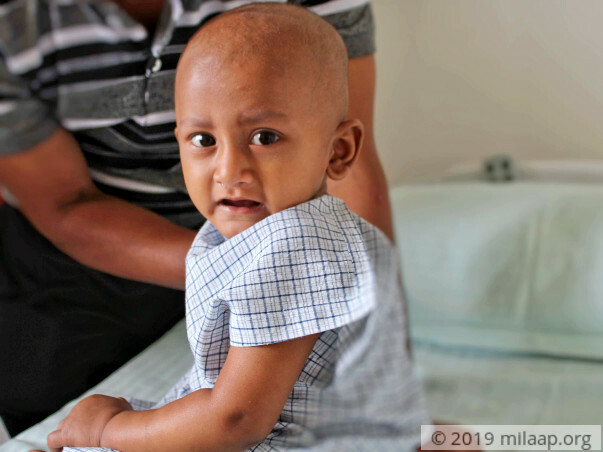 Little Jubaid has already undergone 4 cycles of chemotherapy. Although he has responded well to the treatment, if the tumors are not operated soon he might succumb to cancer. The tumor surgery is the only hope to save the little boy. Julia's world revolved around her sons. It was difficult for her to accept the sudden silence in the home. She started spending sleepless nights just to ensure that she wakes up to see her son alive. My wife has become very weak and cries a lot. She barely eats and sleeps now. I try not to cry in front of her. I knew her to be one of the strongest women, it's difficult to see her shatter into pieces. Yusuf has been away from home for almost 5 months now. All the money that he had is gone now. 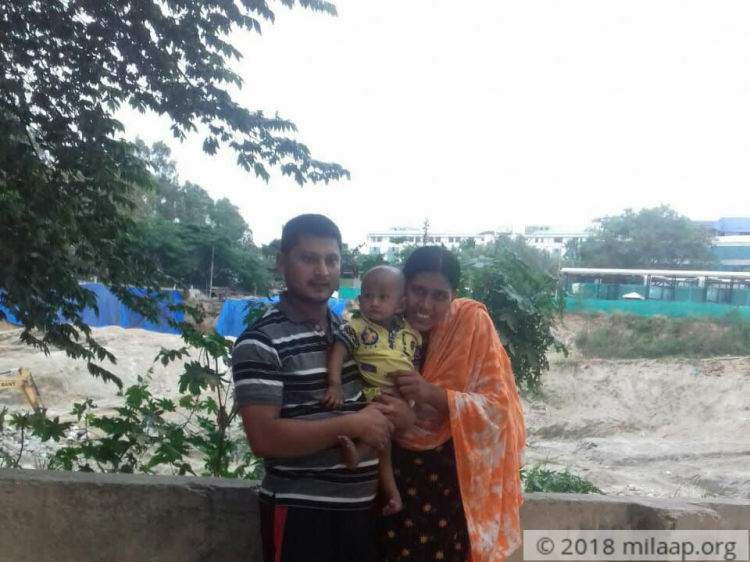 The only land that he owned was also sold when Yusuf's father had to undergo a surgery for his broken spinal cord. Even renting a house and paying for their own food, is something these helpless parents can’t afford now. Yusuf tried to work as a laborer for a few days, but even that didn't help. 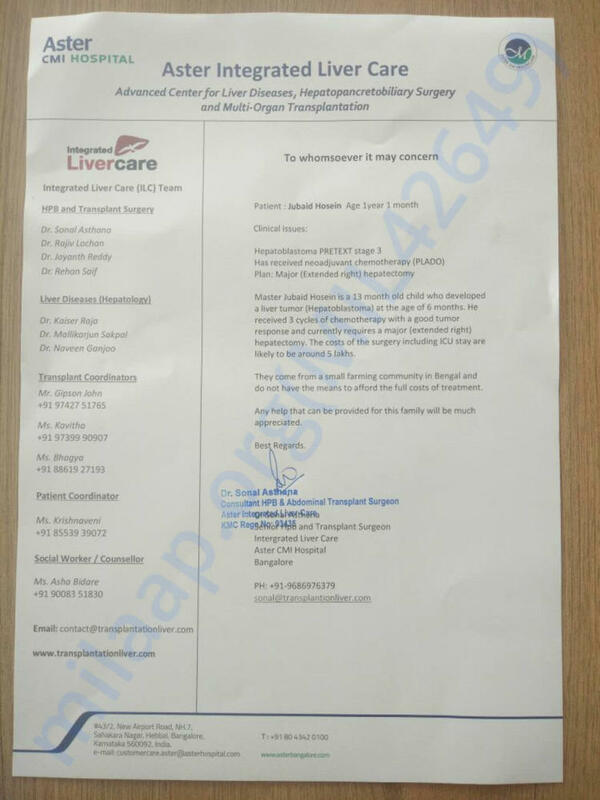 1-year-old Jubaid has cancerous tumors in his liver and he needs an urgent surgery. His father, Yusuf has already spent Rs 4 lakhs. He has borrowed money from everyone he knew and has nothing left to save his baby. The cost required to save Jubaid now is Rs 5 lakhs. Your support can help this baby live. Jubaid is doing good now,he is fine after his surgery. He is coming to hospital only for chemotherapy and check up. We have some good news to share with you. Jubaid underwent the surgery and is currently at home. He has to visit the hospital for the follow-ups. Based on that, doctors can decide if he requires more chemotherapy cycles or not. Please pray for his health and speedy recovery. 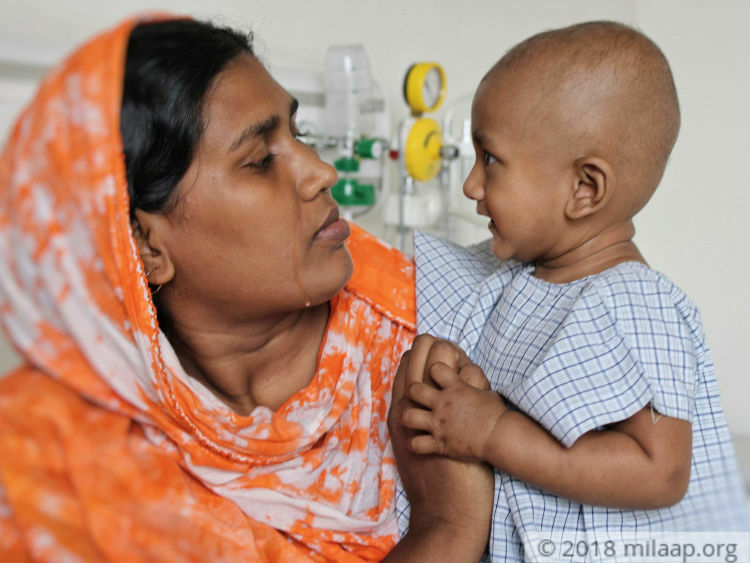 Jubaid is now doing well and was successfully discharged from the hospital after administering a cycle of chemotherapy. We are scheduled to visit the doctor in a week and they shall then take a call on how many more cycles of chemotherapy he might require. Thank you everyone. We shall keep you posted.